Returning for their third album. Swedish five-piece metallers Darkwater, have put together ten tracks for ‘Human’. Formed in 2003, Darkwater have blended together elements of symphonic, progressive and melodic metal to create their sound. Their 2007 debut ‘Calling The Earth To Witness’ was well received by the greater metal community and helped to establish a sturdy fanbase. Live shows followed and after a line-up change, ‘Where Stories End’ was released in 2010. Since then the band have continued to perform live at various festivals across the US and Europe. It’s been some time since a new record has been heard from Darkwater but 2019 is now the time. Has nine years been a creative time for the band? Opening with a soft melodic piano line, the aptly titled ‘A New Beginning’ opens the album. The full band enters on the final piano note with a mixture of blast beat drumming, crunching guitar riffs and synthesisers. It’s a weighty punch to launch into the new album and immediately pulls the listener in with the mixture of heavy riffs and rhythm combined with the catchy melody lines. The piano work maintains lower in the mix and the other instrumentation builds on top. The vocals cut right through the mix thanks to the high register of Henrik Båth, his style compliments the songs sound and is well rounded out with additional harmonies. The prog edge is ever present with shifting time signatures for the break downs, but it does not get overly complicated and retains a very catchy and accessible nature. The piano work retains a solid place despite the full-on band sound, this is due to its use in the break down sections where it once more takes centre stage and delivers a repetitive melody hook. ‘A New Beginning’ delivers all of the stylistic elements of Darkwater in one go. Big melodies, progressive structure and deliver and heavy riffs. However, ‘In Front of You’ showcases an even heavier sound to the opener. A panning effect is used on the opening guitar riff to create a crunching call and response before the powerful rhythm section comes in thickening out the texture and creating a headbanging intro. Immediately the listener is grabbed and pulled in. It’s a track that evolves, as when the initial salvo of heavy backs off, the prog elements move the music into a different direction. The bass and drums lead a brooding rhythm upon which the piano and vocals build before the guitars kick back in accompanied by string pads and the track rebuilds into a heavy weight progressive metal soundscape. Just two tracks in and there is already a lot that has been offered up by ‘Human’. 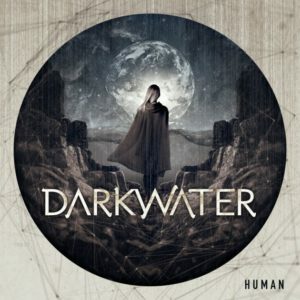 Darkwater have thus far showcased a lot of technical ability as both songwriters and musicians. Things take a more progressive turn with ‘Alive (Part I)’ and ‘Alive (Part II)’, the latter a former ÜR ‘Video Of The Week’. The titles alone are a massive prog style of structure. The former track is a simple guitar and vocal affair, delivering a clean-cut melody that fades out into the latter track. When ‘Alive (Part II)’ kicks in, it delivers possibly the best melody line on the album. Following on from a catchy guitar riff intro, the lead guitar lines provide the melody using a mixture of techniques which are then mirrored on the piano. A rapid, tremolo pick lead line from the guitar goes further, developing the melody into the track. Everything is working together on this track to lift the whole feel of the music from the soaring vocals to the rapid-fire guitars. The addition of string pads bolstering the melody lines and breakdown sections makes this one of the stand out moments on the album. ‘Human’ is not an album that has short songs. With the exception of ‘Alive (Part I)’, all the tracks sail clear of the six-minute mark. With two tracks coming in at over ten minutes. The first is ‘Reflection Of A Mind’ which sits mid-way in the album. At eleven minutes fifty-three, it is the longest track on the record. It’s a progressive metal tour de force. With an operatic intro featuring a string section coupled with the bass and drums, ‘Reflection…’ builds on a brooding nature as more instrumentation in the form of guitars, synths and vocals are added to thicken the texture. All of the stylistic elements of the band’s sound are incorporated in this track and with the addition of a call and response in the vocals there is extra sonic interest. The relentless rhythm section keeps the track moving forward and with various breakdowns the music is in a state of constant shift ensuring it doesn’t get bogged down. The other lengthy number on the album is ‘Turning Pages’. A clean guitar line accompanied by the piano gets things going before the full band comes in. More of a heavier affair than ‘Reflection…’ pounding riffs and drum beats propel the initial part of the track before backing off to allow the vocals to come in. However, the heavy style is repeated throughout the track giving it a sense of a straight forward metal track despite the time length and structural changes that the music undergoes. ‘Human’ covers all the bases of both melodic and progressive metal and also adds in a healthy mix of symphonic metal with the addition of strings and swirling operatic soundscapes. The musicianship from the five band members is excellent along with the song writing. I was initially apprehensive of the album when first seeing how long the tracks were; however, they manage to successfully deliver an album that at no point gets boring. There are occasions where the listener may feel that a phrase or idea has been repeated to many times within one track, but the way the music evolves allows for extra layers to be added and passages blend into something new keeping the flow of the album fresh. While there is a clear concept relating to the album, that of humanity and human life, the individual tracks do stand well on their own, particularly ‘Alive (Part II)’ and ‘Insomnia’, which is further testament to the song writing. ‘Human’ is not an album that is for a quick listen, give it a play through fully at least twice to get the full measure of it and enjoy a hell of journey. ‘Human’ is released on 1 March. You can get your copy HERE.